Former Ph.D. student and Maggie Zimmer starts faculty position at the University of California Santa Cruz in January, 2018 ! 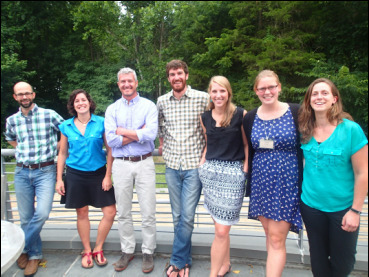 Former Ph.D. student and Erin Seybold starts her post-doc at the University of Vermont ! Former Ph.D. student and Kendra Kaiser starts her post-doc at the Boise State University ! HUGE congratulations to Maggie Zimmer, Erin Seybold, and Kendra Kaiser for successfully defending their Ph.D. dissertations!! Ph.D. student Maggie Zimmer earns a 2016 AGU student paper award for her presentation focussed on shallow and deep groundwater contributions to ephemeral streamflow generation! Former Ph.D. student and post-doc Fabian Nippgen starts faculty position at the University of Wyoming ! Post-doc Christa Kelleher wins a research computing award from Duke University that includes a node the the Duke cluster! Erin Seybold received an AGU Outstanding Student Paper Award for her presentation on stream carbon metabolism, uptake kinetics, and export! Our Foci: Linking watershed form to hydrological, ecological, and biogeochemical function. We study watershed hydrology (streamwater sources, flowpaths, and age), land-atmosphere CO2, H2O, and energy fluxes, watershed biogeochemistry, and hydrological / biogeochemical / ecological implications of landscape change. We employ methods that include source water tracing, physical hydrology, eddy-covariance, and landscape analysis techniques. Our field-based research is focused on the spatial and temporal scaling of hydrological, biogeochemical, and ecological processes across natural and disturbed watersheds and stream networks. *Rinderer, M., B.L. McGlynn, And I. Van Meerveld. 2017. Groundwater similarity across a watershed derived from time-warped and flow-corrected time series. Water Resources Research. Ward, A.S, C.A. *Kelleher, S.K. *Mason, T. Wagener, N. McIntyre, B.L. McGlynn, R.L. Runkel, and R.A. Payn. 2017. A software tool to assess uncertainty in transient-storage model parameters using Monte Carlo simulations. Freshwater Science.